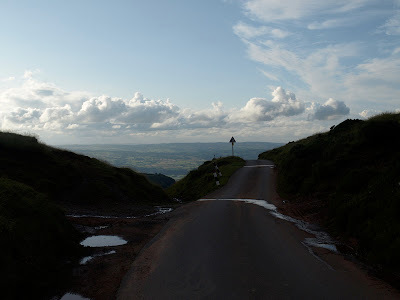 I drove down to Wales last Thursday, left my car at my sister's house and biked off over the Black Mountains towards Hay-on-Wye. It was a lovely afternoon and I biked up narrow, tree-lined lanes by a river past Llantony Priory to the top of the Gospel Pass, where an elderly couple in a small white Romahome van offered me a hot drink. Then I set off down a glorious descent in the evening sunlight, thinking about camping and cooking supper. 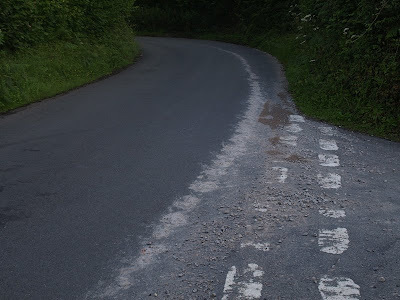 I was most of the way down when I came round a bend and hit the special bike-dumping substance which had been laid in my path. The usual slow-motion effect followed as I decided I'd have to go into the hedge. I bounced off the hedge and hit the road with the bike on top of me. Anmazingly, no damage had occurred to the bike. I had a nose-bleed and various bumps and cuts on my leg, but I could stand up, and even ride the bike. So I rode to a campsite and the following day I carried on cycling towards Builth Wells. At first I was feeling quite pleased with myself. My leg hurt every time I turned the pedals, but it was working. By the time I reached my destination it was becoming ever harder to move. By the time I'd eaten lunch (I recommend the cottage pie at the Strand Cafe!) I'd concluded that my cycle tour was over, and I had to phone my sister for rescue. I think I am fated never to cycle up the Elan valley, which was my intention. I had to cancel a similar mission once before.